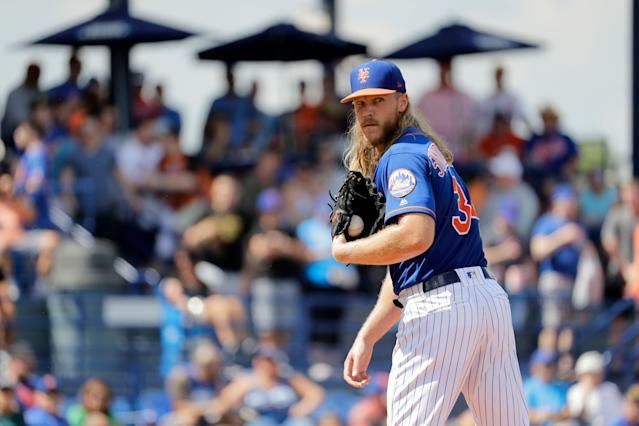 Noah Syndergaard held nothing back in talks with media prior to getting the start in a minor league spring training game in Florida on Sunday afternoon, unleashing his thoughts about the team’s workout schedule and negotiations with fellow star pitcher Jacob DeGrom. The club will be heading to Syracuse, home of their triple-A affiliate the Syracuse Mets, for a workout later this week. Syndergaard, apparently, is strongly opposed. “We’re going to Sarasota, and then to Syracuse, and then – you’d think we’d go to New York to get, as adults, our things and our affairs in order, but no – we’ve got to go to Syracuse first,” he told The Athletic’s Tim Britton. Syndergaard added that others on the team share his sentiment, and tried to voice their concerns, but it “[didn’t] really do much.” He said he could use the extra time in New York City to set up his apartments and get adjusted to playing night games, rather than waking up early, as is the case in spring training. Naturally, once it was clear Syndergaard was ready to open up on the front office’s wrongdoings, an obvious question arose: what does he make of the team’s lack of an extension thus far for Jacob DeGrom, whose contract ends in two years? Given the recent extensions signed by other players of DeGrom’s caliber, Syndergaard added, the time seems right. Over the winter, DeGrom received the largest arbitration raise in MLB history by agreeing to a $17 million deal for 2019, and is the reigning Cy Young winner. Boston Red Sox and Sale agreed to a five-year, $145 million extension, and Justin Verlander signed a two-year, $66 million agreement with the Houston Astros – DeGrom is a relative bargain in comparison.